L.A. Brooklyn Bridge Boot Camp | Are you wasting your time in the gym? 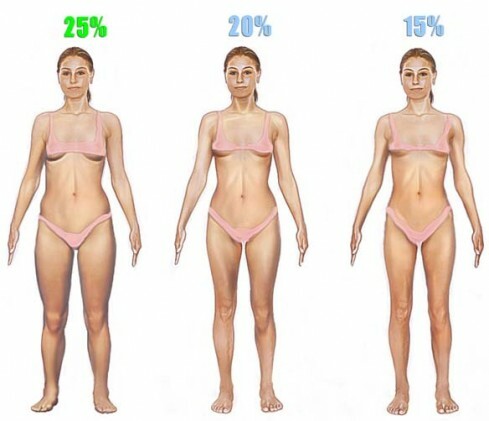 var scss_share_image=""
You are here: Home / Blog / body fat percentage / Are you wasting your time in the gym? Before you start your workout you eat a snack because you think you need the energy. You eat nuts or granola, energy bars, dairy or fruit and then spend an hour doing cardio on the treadmill or elipticial or take a conditioning class. What’s wrong with this approach? Well, the issue is that fat loss only happens when your body runs out of energy from carbs. If you eat lots of carbs every day you will burn only carbs and never body fat. What constitutes lots of carbs? For the average 150 lb woman that would be more than 150 grams per day. For the average 180 lb guy about 180 g of carbs per day. The only way you will ever change the shape and look of your body is by burning off the body fat that covers your muscles. 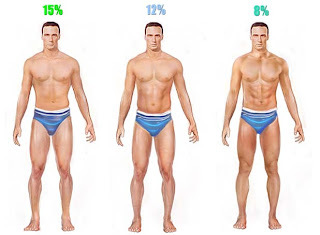 Unless you drop to a body fat of about 20% for women and 16% and below for men you are not going to see any muscle tone because the muscles are hidden underneath a layer of fat. 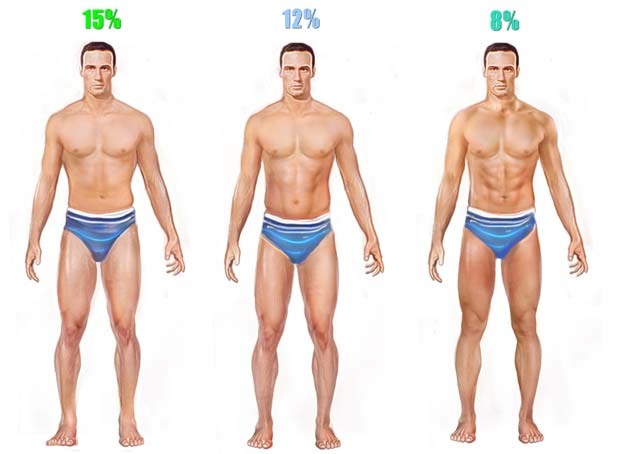 Take a look at the pictures below, which illustrate the level of definition based on your body fat percentage. When you work out your body uses energy initially from the carbs in your blood sugar. That might last you about 20 minutes – depending on how long ago you had your last meal and how many carbs you ate. (Just imagine that your first 20 minutes running on the treadmill might not even burn any body fat – but only carbs!). Once the blood sugar resources are used up, your body turns to carbs stored in your liver and muscle. These carbs are called glycogen. The muscles can hold up to about 450 grams of carbs if you have a lot of muscle and much less if you have little muscle (that’s why you want to strength train. The more muscle you have, the more glycogen they can hold without making you fat!). The liver can store about 100 grams of carbs. Both muscles and liver can store about 2,000 calories worth of glycogen, which can provide you with about 3 hours of energy during an endurance event or last you for about 2 days if you keep a moderate carbohydrate diet. Only once those stores in the muscles and liver are used up will you burn fat . So, make sure you reduce your carb intake throughout the day to about 30 g per meal to allow your body to use energy from body fat instead of energy from carbs. Once the time for your workout comes, you’ll burn through your blood sugar energy and muscle and liver glycogen stores quickly and then draw energy from your fat stores. 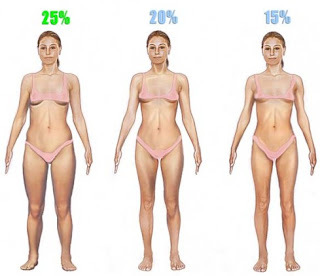 Did you know that the average person can live for several weeks without food because your body becomes ultra-efficient at burning fat as fuel? That’s how much body fat we all carry on our bodies. Dairycan make you congested so reserve it for refueling after your workouts or skip it entirely. Nuts are too high in fat and that can make you sluggish during your workout. Granola is loaded with sugar and 1/3 cup has about 40 grams of carbs. You might have to run on the treadmill for about 30 minutes to just burn through the food you ate to fuel your workout – that’s a total waste of time. Use the fuel stores in your body. Fruit converts into fructose, which is used by the liver, but not your muscles. The muscles will only use it for energy if nothing else is available, so save yourself the fruit sugar. If you want to lose fat and maintain muscle, then do your workouts on an empty stomach first thing in the morning. If you work out at night them have a snack or protein shake about 90 minutes before your workout. A non- carb/low-carb protein shake is best since it will allow you to maintain muscle while promoting fat burning. And, the best fat loss trick of all is to finish your day with a protein shake instead of a heavy dinner. Not only will you wake up feeling energized and refreshed but also quite a bit lighter. What’s happening in February… Are you in charge of your health?